Our Products >> Custom build rear sprocket, Blanks, Race wheels. 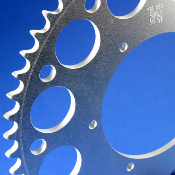 >> 0552 - Quick Change Sprockets, 520 or 530 chain size. 0552 - Quick Change Sprockets, 520 or 530 chain size. 0552 - Quick Change Sprockets, 520 or 530 chain size. Fits quick change hubs. Sprocket center hole is 2.50 inch or 63.5mm. Bolt circle diameter is 3.00 inch or 76.2mm, with 8 bolt holes at 7/16 inch or 0.437 inch or 11.09mm. Available in 520, 530 chain sizes. Note: Please measure your sprocket and or sprocket hub to check sizing and compare to our sprocket dimensions shown above.